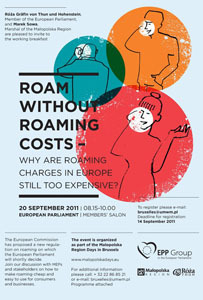 On September 20, Róża Thun MEP, who also supports our campaign, will host a working breakfast and debate with MEPs and Stakeholders on the new EU roaming regulation. The event will take place from 08:15 to 10:00 at the Members’ Salon in the European Parliament in Brussels. During the discussion the Polish Telecoms Regulator will present its proposal on how to lower roaming cost further by injecting more competition into the European telecommunications market. Further speakers are expected to include Róża Thun MEP and Marek Sowa, Marshal of the Małopolska Region; Vesa Terava, Head of Unit, DG INFSO; Angelika Niebler MEP; Wolfgang Kopf, Senior Executive Vice President, Public & Regulatory Affairs, Deutsche Telekom; and Monika Stajnarova, Junior Economic Officer, BEUC. For more information on the event and to register, please head over to the website of Róża Thun MEP.